The people of Israel grew up listening to Scripture: “Hear, O Israel, the LORD our God, the LORD is one” (Deut. 6:4). Hear. Listen. Allow the words to enter your soul through your ears. Before any of Israel’s great stories of faith were written, they were spoken and heard in the form of narratives, parables, and sayings. The people lived a Scripture-listening life. We’ve lost much of that experience, haven’t we? We rarely hear God’s Word read over us, the words ringing out in the sky or around the sanctuary or in our earbuds. Yet we ought to recover this listening life, a life committed to soaking in Scripture. This spiritual practice isn’t just significant because our Christian ancestors did it; it’s significant because Scripture-listening forms us in ways Scripture-reading cannot. Listening shouldn’t make you diminish the practice of reading Scripture one bit—it’s crucial. Nevertheless, I want to draw your attention to the lost art of listening to God’s Word. So how do reading and listening shape us in different ways? When we read, our default tendency is to study, to pull apart the text and piece it back together, and to draw conclusions. We’re after comprehension: to grasp with the mind, to sharpen our thinking, to learn, and, above all, to understand. When we read, we want to get something out of it. Scripture-listening forms us in ways Scripture-reading cannot. When we listen, we have to leave all that behind. We lose our ability to be precise; there’s no underlining, cross-referencing, or consulting commentaries. Listening is more leisurely. When we listen we’re after apprehension: to lay hold of something, or better said, to have something lay hold of us. We’re seized, captured, and engrossed—similar to what happens with music. We get lost, caught up in it. Scripture-listening allows the Bible to captivate us in new ways. One of the most important values of Scripture-listening is that we can listen while we’re doing something else—driving, lifting weights, folding laundry, or taking a walk. Our heart dwells on a passage while our body processes a routine. We’re hearing from God and living our lives simultaneously. Scripture-listening allows the Bible to captivate us in new ways. Charles Spurgeon had a wonderful phrase: “Be walking Bibles.” This forms a picture in my mind of what I want my life with Christ to be about. I want to live in a state of ongoing communion with God, even while getting on with the business of living. When I listen to Scripture, it’s as if I’m in two places at once: with him and with the world. I’m in it but not of it. Few activities are more restorative than moving through the world while nourishing your inner world. And listening to Scripture helps to accomplish this by enriching your experience of the present moment. Again, Spurgeon is helpful: “Visit many good books, but live in the Bible.” Listening to the Bible—right in the middle of your ordinary life—is a powerful way to live in the Bible. 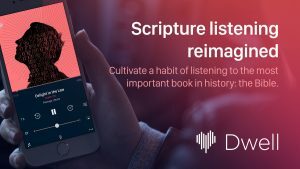 Author’s note: Thanks to innovation and technology, we can easily listen to Scripture on our phones. I’m working with a talented team to create a beautiful Scripture -istening app called Dwell. We just launched a Kickstarter Campaign, and we’d love to share more about our project there.